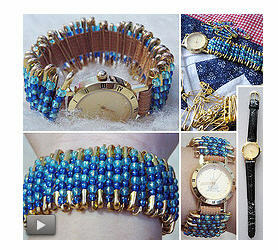 Does anyone have the basic intructions for making watches with beaded safety pins strung on stretchy string? Note about the image above: I hunted around and found this picture on the below-mentioned forum post. I am still awaiting approval on posting the image but I couldn't wait! "Safety pin jewelry is the easiest jewelry in the world to make. To make a watch, there are a couple of different techniques you could use. 1. You can take sewing elastic the is the width of the bar of your watch. Remove the watchband obviously. Fold the end over the band bar and hand sew it. 2. Load safety pins with beads. Depending on the size of your wrist you may need 30 or 40. 3. After you have loaded the pins, be sure to crimp close the head of the pin so that it won't accidently open. 4. Slide the full pins onto the elastic, alternating top and bottom. 5. When it is as long as you need, wrap the elastic over the watch bar on the other side and tack it. 6. If you can see the elastic on the watchbar and don't like it, pin on a beaded pin. The second way is to load the pins, crimp them closed, then take jeweler's elastic and crimp it onto the watch bar. You will need two pieces...one will go through the top of the pin, one through the bottom. Once the pins are loaded, thread the pins on the elastic alternating head and foot. I teach jewelry making to 9 and 10 year old girls, and this is one of their favorite projects. She has some on her Etsy site. Tell her I sent you! I have been having no luck in finding info and the photos on the safety pin Watch band are not so good. I did find your info helpful. This pic is awesome! Very detailed!!!!! What size safety pins do you suggest? I am concerned about the silver pins, which are nickle coated, causing a metal skin allergy. I suppose we could paint the metal that would touch the skin with clear fingernail polish. Wow, I like the idea. It is so cool, more than the watches that you can see at www.Lady-Watches.net. Love the elastic instead of the elastic cord. It is more durable. I got a lot of compliments on my band.